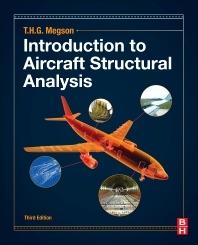 Introduction to Aircraft Structure Analysis, Third Edition covers the basics of structural analysis as applied to aircraft structures. Coverage of elasticity, energy methods and virtual work set the stage for discussions of airworthiness/airframe loads and stress analysis of aircraft components. Numerous worked examples, illustrations and sample problems show how to apply the concepts to realistic situations. As a self-contained guide, this value-priced book is an excellent resource for anyone learning the subject. T.H.G. Megson is a professor emeritus with the Department of Civil Engineering at Leeds University (UK). For Elsevier he has written the market leading Butterworth Heinemann textbooks Aircraft Structures for Engineering Students and Introduction to Aircraft Structural Analysis (a briefer derivative of the aircraft structures book), as well as the text/ref hybrid Structural and Stress Analysis.